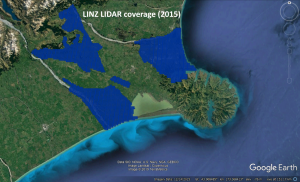 An open competition soon to start will provide a wonderful opportunity for smart people of any age in New Zealand to take on the challenge of how we might assess water and soil pollution using satellite and drone data. What they might choose to do in attacking such environmental problems is limited only by their imaginations, and technical capabilities. All are invited to climb aboard and put in an entry, with expert mentoring and access to various commercial datasets being made available to the up-to-twenty successful applications (by teams or individuals) chosen for the incubation period over the next six months. Let me tell you about the New Zealand Aerospace Challenge. Better yet, let me direct you to the website that will give you all the details (though I will also use it as an excuse to show you below some super satellite imagery of NZ). The Aerospace Challenge (hereafter just Challenge) follows on from last year’s highly-successful Space Challenge (see also here and here), with a tweak: in 2018 it was about the use of space technology alone, whereas in 2019 the gamut has been widened to include ‘aero’ — specifically the utilisation of UAVs (or drones, in the popular parlance). Participants – entries are welcome from both individuals and multi-person teams – can gain a lot from getting involved regardless of whether they win one of the above three prizes. Up to twenty applicants (teams or solo entrants) will be selected on the basis of their proposals being judged feasible, and then offered assistance and mentoring across the following five-to-six months before the national finals in October. Up to ten teams will be offered the chance to present at those finals, following their efforts during the preceding incubation period. 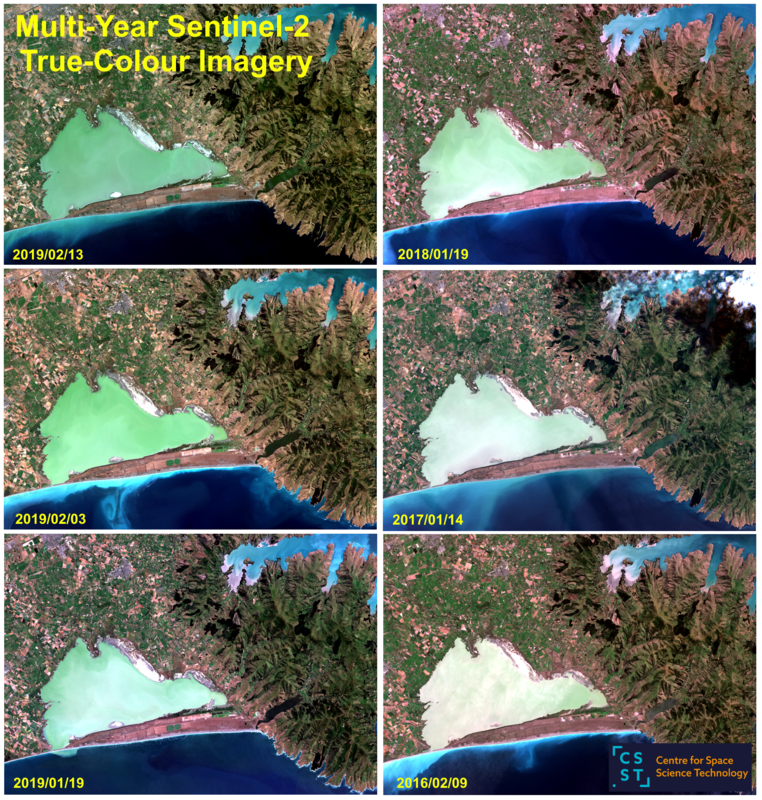 Assistance across that multi-month incubation period will include access to commercial satellite data which would normally be costly, courtesy of Airbus, the company’s OneAtlas Sandbox also being available for image analysis. More-focussed on imagery collected by UAVs/drones? Airways will be providing assistance with such matters as UAV flight planning and navigation within recommended areas. A host of other partners and sponsors will similarly be making help available to the possibly-twenty teams making it into the mentoring/incubation stage, running from May through until the end of September. Want to enter yourself but need suitable collaborators to form a team? File an entry and the organisers can join you up with others located elsewhere in NZ who have complementary skills so as to form a team with all the needed background. There is a vast, vast amount of satellite data available for teams who have bright ideas they’d like to trial and prove in the Challenge. Here I will give just a few examples. If imagery covering that whole area were made available, participants might use a lot of bandwidth downloading and then handling the data. In order to make things easier, and the files smaller, the good people at Spacebase chose a limited region around Lake Ellesmere, including parts of Banks Peninsula and also the Lincoln University Dairy Farm, which might be an area of interest in that soil measurements of various descriptions will surely be available; and in terms of water pollution, the seasonally-changing colours of Lake Ellesmere might be telling us something. The resultant reference area* is as shown in the next graphic. 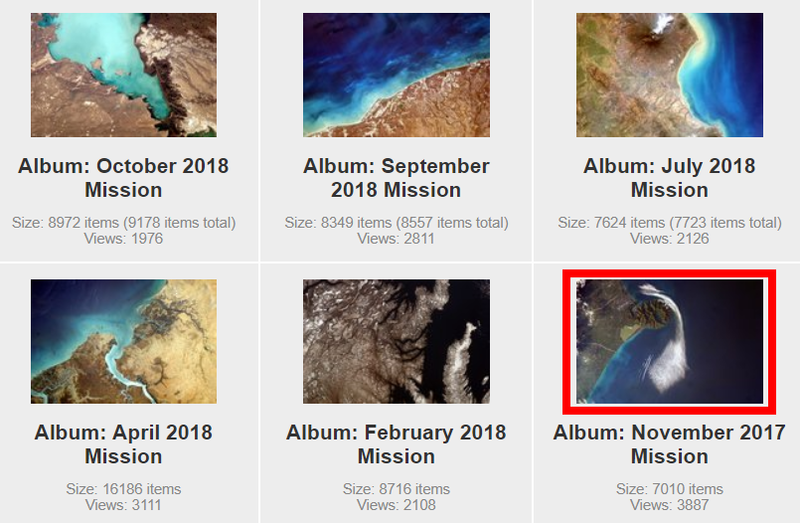 Most of those thumbnail images were obtained between February 2018 and the same month this year; just a few at the end were added from 2016 and 2017 so as to indicate that lots more historical images are available. Now, the above frames were essentially showing ‘true-colour’ images (red/green/blue) made up from data collected in the visible spectrum. In fact there are many wavelengths of electromagnetic radiation that our eyes cannot detect directly, and yet we can operate sensors on satellites that will pick them up. The Sentinel-2 satellites (there are two of them, A and B, scanning the whole globe every five days) have a capability to collect images covering 13 different bands, across the visible and then out into the near infrared (IR) and thence the short-wave IR. At right is a full set, greyscales indicating the intensity in each band. It is obvious that the fluxes depend heavily on the wavelength, with Lake Ellesmere appearing bright at the blue-green end of the spectrum (i.e. it reflects a lot of blue/green/yellow sunlight), but darker in the red and then almost black in the IR. A rather different type of measurement that satellites can assist in making is the elevation above sea-level of points beneath. 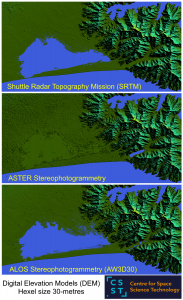 We call this ‘terrain’ information, and often data files are labelled as ‘DEM’ (digital elevation model). 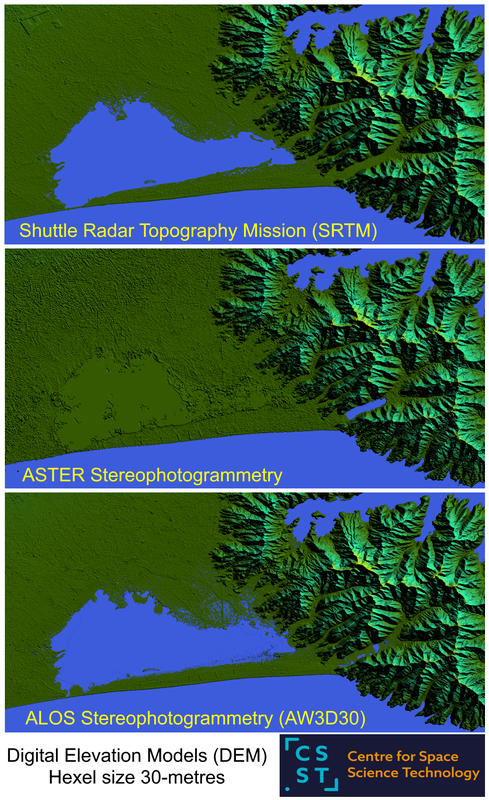 Following is a graphic showing terrain maps obtained using three different satellites: one radar (carried on the Space Shuttle) and two using optical methods whereby pairs of images can be cross-correlated and the parallax measured can be interpreted to deliver DEM measurements (just as your two eyes enable you to determine depths and distances). 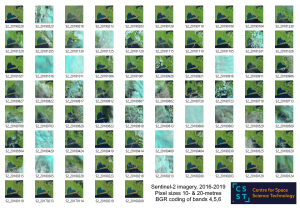 The above examples pertain to a small subset of all the datasets available, from many satellites and other sources including aircraft and drones. 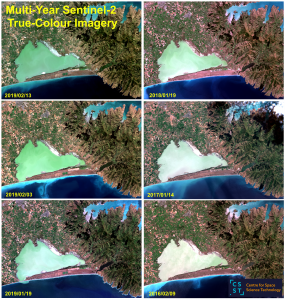 Satellite imagery with better spatial resolution than the above will be available to Challenge participants courtesy of Airbus, and that company also is responsible for the commercial operation of several synthetic-aperture radar (SAR) satellites built by national space agencies in Europe, SAR data being able to deliver different insights as to what is happening at ground level than optical (visible/infrared) satellites. The story I am trying to tell here – or at least its opening chapter or two – is that there are many sorts of data available to Challenge participants, and much that can be done. An important thing to note is that there are no age limits for participants: it’s all on for young and old. Most of last year’s entries were undergraduates or scientists/engineers in early- to mid-career stages, but that does not mean that younger or older entries are not welcome. It is entirely feasible that bright and enthusiastic high school students, for example, could come up with some radical ideas and also imagine new ways of using technology for the benefit of NZ’s waterways and soils. If inspiration is needed: about a dozen teams entered the 2018 ActInSpace Hackathon held in Christchurch, the youngest being a group of five pupils from Dunstan High School in Alexandra, Central Otago. They placed second overall… and ended up on an all-expenses-paid trip to Toulouse in France to attend the international ActInSpace finals (the winning NZ team being the national entrant – and they did really well). There’s not much else I can say, apart from apply here. The deadline is fast approaching: Monday April 15th. 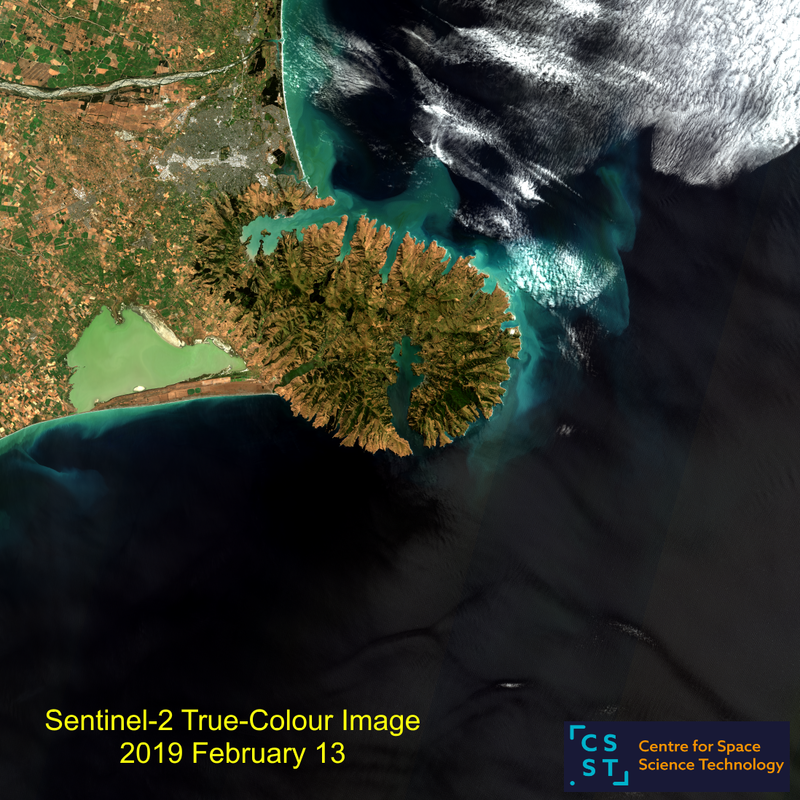 A note on the image covering Banks Peninsula and surrounds that forms the header to this blog post… These extinct volcanic craters and also the conical Mount Egmont in Taranaki are undoubtedly the favourite sights (and sites) in New Zealand for orbiting astronauts, judging from the number of photographs they take of them from the International Space Station (ISS). This particular photograph, though it was obtained from the ISS, was not the result of an astronaut clicking a shutter on a hand-held camera; rather, it was obtained by the Sally Ride EarthKAM which is (very simply) a Nikon digital camera that is fixed to look downwards through a window on the ISS, and is controlled by a Lenovo laptop. Why am I bothering to tell you this? Well, the EarthKAM is available to all comers, with schools around the globe being invited to participate: the system has been established specifically for middle-school years (ages 11-13), although younger and older grades (and universities) may also ask for images to be obtained for them.